If you want to upgrade the look of your bathroom, but you don’t want to do a full renovation, consider placing gorgeous granite accents in your space. Granite comes in many beautiful colors and patterns. Once you find the perfect design, one which fits in with the rest of your decor, you’ll be able to create a whole new look in your home. Create an Accent Wall – One gorgeous way to update the look of your bathroom is to create an accent wall of granite. If you have a freestanding tub, choose the wall behind your tub to accent for an exquisite look. For a built-in bathtub, select an adjacent wall to highlight. As an alternative, you can opt to tile the wall behind your vanity from floor to ceiling to add a dramatic appearance to your space. Create a Shower Niche – Selecting a contrasting color of granite for your niche will make it stand out and create an elegant accent inside your shower. You don’t have to settle for an ordinary design though. Consider one with several shelves in a long vertical column. Or install a horizontal niche that runs the length of the shower wall. You can even opt to have two shower niches put in and designate one for yourself and one for your spouse. Create a Shower Bench – Another great accent is a bench for your shower, covered in chic-looking granite. Such a feature adds function and beauty to your bathroom. You’ll love sitting on your fabulous bench seat while warm water sluices over your body and relaxes you. This addition will also come in handy if someone in the family has an injury and can’t safely stand for long periods of time. 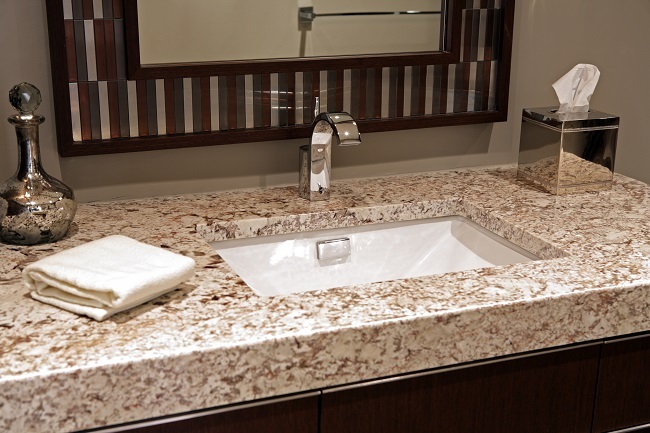 You can update the look of any bathroom by adding stylish granite to the decor. For more information about granite or renovations in your home, please contact us today. At Granite & More in Frisco, it is our goal and passion to make your home renovation process smooth and hassle-free. We have a team of dedicated tradesman who specialize in kitchen and bath remodeling and get it done right on time and on budget.